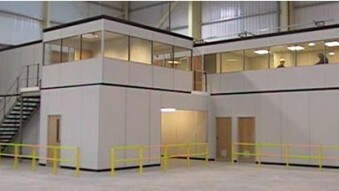 As a manufacturer of mezzanine floors for over 25 years, you can be sure that when you contact Space Design with your requirements, you are dealing with a company that has vast industry knowledge and expertise in all aspects of mezzanine flooring, from the initial consultation through to design, manufacture and installation. We are fully aware of current Building Regulations requirements and can handle all necessary submissions for the relevant approval. 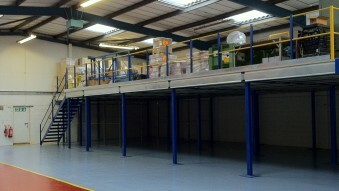 Our mezzanine floors are installed to create extra space for offices, storage, production, retail and many other uses. Browse our other pages for more dedicated information on how we can best help your business. Our Mezzanine Floors are the perfect solution for your space requirements. 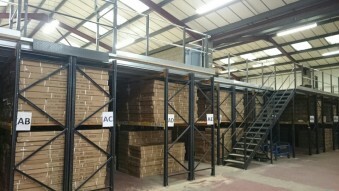 A mezzanine floor by Space Design can be a perfect solution for your storage space requirements. We will design, manufacture and install your mezzanine floor as well as any additional storage products, such as shelving and racking. Our mezzanine floors are individually designed to suit each particular application, always with current building regulations in mind. Our industry knowledge means that you will always get the right option for your requirements and that knowledge is transferred to a great customer service and after care. Find out more about our storage solutions by visiting our Storage page. If you are in need of extra office space the answer might be to expand upwards. 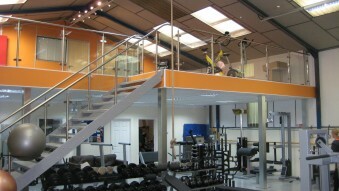 A mezzanine floor by Space Design could be the perfect solution to your space problem. Our office mezzanine floors can be installed quickly and easily and can effectively double your existing ground floor area. As a manufacturer, we are able to offer expert advice from our dedicated team along with competitive pricing. We can also deal with all the necessary building regulation applications as well as providing a free design consultancy and technical CAD drawing. To complete the service we also carry out partitioning work, suspended ceilings along with other services such as electrics and flooring. Whether you need to extend your sales floor or add more space to your showroom we can help to create right look. Using a combination of modern materials, such as glass & stainless steel handrails, we canÂ achieve a seamless extension to your retail space. Space Design are experts at fast installation meaning minimal disruption to your business. Each mezzanine is designed individually, and can be used to provide additional retailÂ or storage space. To see all the latest examples of our complete range of Storage Solutions. Be sure to view the Space Design image gallery here. Take advantage of your FREE design consultation from Space Design Ltd.
Or fill out the form below to find out how we can best service your project requirements.